A few years ago I had a sweet cucumber granita and mint topped oyster at The Hangout Oyster Cookoff, and was immediately reminded of a crisp, cucumber cocktail. The seed for Cucumber Mint Oyster Shooters was planted. Cucumber, fresh mint, and ice cold vodka blend into one of the most cooling, refreshing sips imaginable. It turns out a briny oyster is right at home in these waters! Usually, these are slurped down within a moments of adding the oyster, and raising and clinking glasses. But, when shooting this recipe’s video, the team had to slow down. We noticed a little magic. You’ll see that the oysters drop to the bottom of the shot glass when added to the drink, but within about 30 seconds they float back up. We decided this was the sign that they are perfectly ready for a toast. Cheers! Muddle cucumber and mint in a bar glass. Add vodka, lime juice and simple syrup. Add ice to nearly fill the glass. Stir until well blended and cold. Strain into four shot glasses. 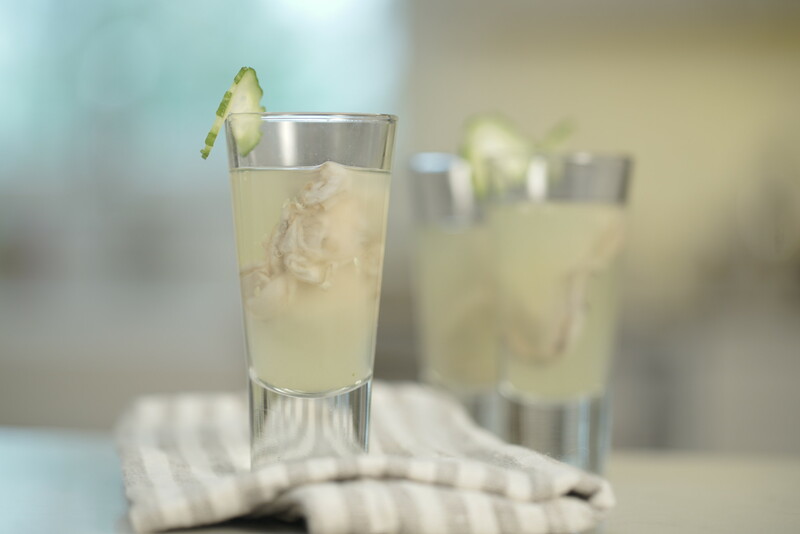 Add one freshly shucked oyster to each glass and garnish with a thin cucumber wheel. Find hundreds of oyster recipes from your favorite chefs, magazines, cookbooks, and food blogs.